Buying a stainless steel grill isn’t easy. In fact, buying any kind of grill is going to require some time and effort on your part. There are so many choices available with varying sizes and features. The only thing easy about buying a stainless steel grill is getting the wrong one. If you don’t have the time to spare looking over every single stainless steel grill in the market, we’ve got just the list for you – the best stainless steel grills to suit every outdoor chef. What should I look for when choosing a stainless steel grill? How do I choose a grill? What grate material should you choose? Our Pick: The Napoleon Grills Prestige 500 with Infrared Rear Burner is the best stainless steel grill we’ve encountered for numerous reasons. Yes, we were very much attracted to it because of its shiny, polished appearance. But that’s not what truly bowled us over. The grill is constructed of high quality 304, 430 and 204 stainless steel, powder coated aluminum and a powder coated steel. It comes with 500 square inches of primary cooking space as well as a warming area that measures 260 square inches. There are 4 main stainless steel tube burners that have a total output of 48,000 BTUs that can be started individually using the Jetfire Ignition with crossover lighting. The grill comes with 7.5mm stainless steel iron wave cooking grids that provide excellent heat retention. Dual level, stainless steel, sear plates catch the drippings and vaporize them to add flavor. This also helps control flare-ups and keep your meat moist. The rear infrared burner is also made of stainless steel with an output of 18,000 BTU and the rotisserie kit enables you to roast meat. Folding shelves add prep space while the integrated utensil holders and cabinet lets you store grill accessories near at hand. The locking casters let you move the grill around and secure it in place. However, there have been reports that the burners start to rust after a couple of years. And the drip pan is a bit too small. 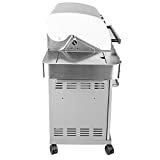 The Lion 32 Inch Stainless Steel Propane Gas Grill On Cart is made of commercial grade 304 stainless steel. 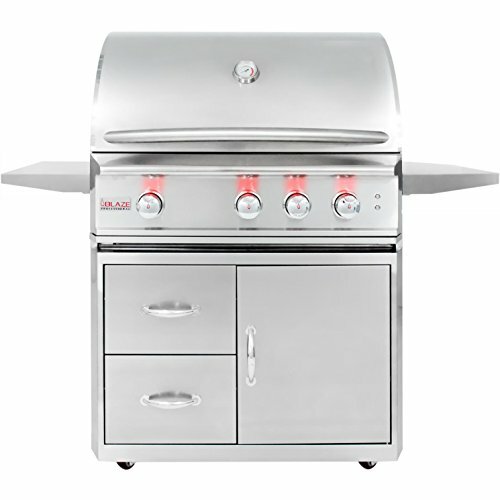 It has a double layer, seamless welded, stainless steel grill head for durability. The 4 burners have a max output of 60,000 BTUs while the rear infrared burner has 15,000 BTU. There are 647 square inches of cooking space provided by premium solid stainless steel cooking grates. The grill comes with a gourmet package which includes a rotisserie, griddle, griddle remover, and a smoker box which increases its versatility. There’s an interior light that enables you to cook in the moonlight. There are side shelves, cabinets, and integrated tool hooks provide you easy access to all your grill accessories. However, the grill does not have even heat distribution; there are hot spots. The grates flex a little when the heat is pretty high. Also, the grill isn’t well-suited for low and slow cooking. Best for large family: The Royal Gourmet Mirage MG6001-R Two Split Lid 6-Burner Gas Grill is an entire backyard kitchen on wheels. There are six main burners and a primary cooking space of 697 square inches which are split into two sections. There are two heavy duty stainless steel lids and two separate porcelain enamel coated fireboxes. This feature allows you to cook different foods at the same time, at different temps. Aside from the main stainless steel tube burners, there’s also a brass side burner and an infrared rear burner which gives the grill a total output of 96,000 BTUs. The stainless steel side table features integrated tool hooks. 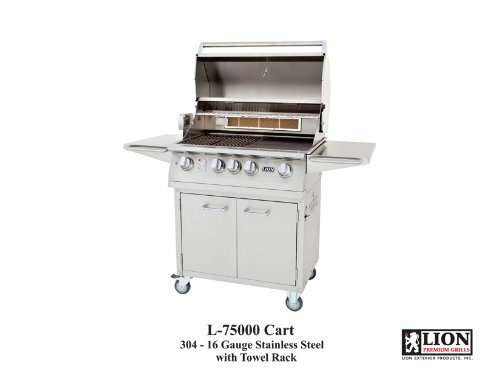 In the cart, the stainless steel doors hide enough storage space for all of your grill accessories. The porcelain-enameled cast iron cooking grates are perfect for retaining heat and features a slope design to keep the oil flowing. The W-shaped Flame Tamer helps prevent flare-ups and distribute the heat more evenly. However, it doesn’t come with a rotisserie. Assembly is a bit difficult. Best with rotisserie: The Broil King Regal S590 Pro is a stainless steel gas grill with 5 burners that has all you could possibly want. 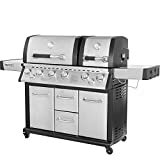 It has 5 stainless steel dual-tube burners with a total of 55,000 BTU, a 10,000 BTU side burner, and a 15,000 BTU rear rotisserie burner plus a premium rotisserie kit. The burners have a patented dual-tube design that has two rows of flames per burner which ensures even heat distribution. The stainless steel Flav-R-Wave cooking system also provides even heat distribution as well as the smokey flavor that we all love in our barbecue. The 625 square inches of cooking space provided by the solid stainless steel 9mm rod cooking grids is large enough to cook food for an army. However, the screws included with the grill are sometimes stripped. The drip tray is a bit small. Plus, the handle gets a bit hot. Best Value: The Monument Grills 4-Burner Gas Grill is one of the most powerful stainless steel grills we’ve come across. It has 4 main burners plus a side burner and a side sear burner which gives it a total of 72,000 BTUs. All that power helps you produce a complete meal for your entire neighborhood, especially since the grill has 513.3 square inches of primary cooking space as well as 210 square inches provided by the side burner and the warming rack. Porcelain-coated cast iron cooking grates are great for retaining heat. The LED blue lights on the knobs show you at a glance what the temperature setting is even at night. The best thing about this grill is the price. For less than $400, you definitely get more bang for your buck. However, there are hot spots when you crank the heat up high. You’ll need to cook using moderate temperature to even out the heat and remove any hot spots. Assembling the grill isn’t easy. And the warranty for the grill is just 1 year. 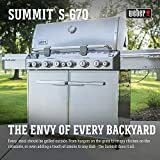 Best built in: The Lion Premium Grills 90823 40″ Natural Gas Grill is a built-in gas grill made of 304 16 gauge commercial grade stainless steel. This huge grill has 1030 square inches of cooking surface and 5 cast stainless steel burners that have a total output of 90,000 total BTUs. 6 commercial size push-to-turn knobs make it easy to control temperature while the XL commercial temperature gauge lets you easily monitor the heat under the hood. 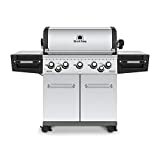 The grill also features Lion Quick Lite valves, an adjustable warming rack, premium solid stainless steel cooking grates, and an infrared rotisserie back burner. Cooking at night was never so good with the 2 interior lights built into the grill. Even better, you get the gourmet package along with the grill which includes a rotisserie, cover, smoker box, griddle, griddle remover, and bottle opener). However, the double-walled lid which is made of stainless steel doesn’t seem to handle high heat very well. The interior layer deforms a bit while the exterior layer remains cool. There’s also a hot spot or two. 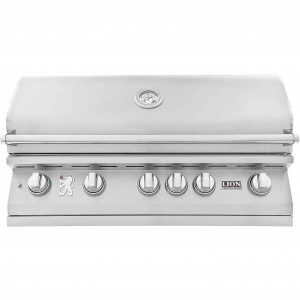 Best for professionals: The Blaze Professional 3-burner Propane Gas Grill B00KCK577Y is the perfect choice for outdoor chefs who want to experiment with their cooking. 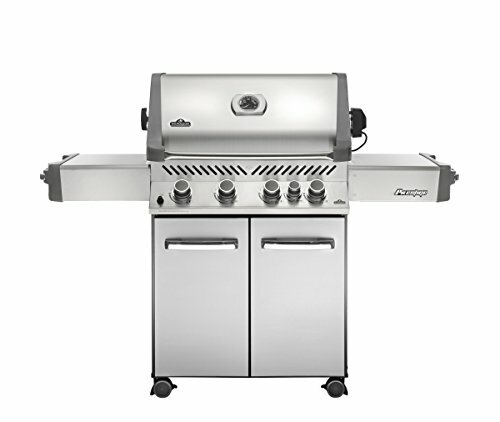 This beautifully crafted grill is made of heavy gauge stainless steel, featuring three commercial quality, cast stainless steel H-burners, each with an output of 18,000 BTUs. There’s an infrared burner as well for indirect cooking along with a rotisserie kit. Stainless steel heat zone separators enable you to create different cooking zones on the 615 square inches of cooking space. The heavy-duty 12mm hexagon, stainless steel cooking rods are excellent at retaining heat and creating beautiful sears. The full-width, roll-out drip tray and removable baffles reduces any mess from juicy meat, making cleaning the grill that much easier. And interior lights as well as red LED lights illuminate the knobs which allow you to enjoy grilling in the moonlight. Four heavy-duty, locking wheels allow you to move the grill from one end of your backyard to the other much more easily. Plus, the grill comes with a lifetime warranty. However, some owners report having problems with the ignition system of the grill. Best Value: While Weber may be the king of all charcoal grills, their gas grill models aren’t anything to scoff at either. If anything, the Genesis II S-340 Gas Grill is one of the best you’ll find. The model series feature grills that have two, four, and six burners, making it easy to find the right size for you and your family. 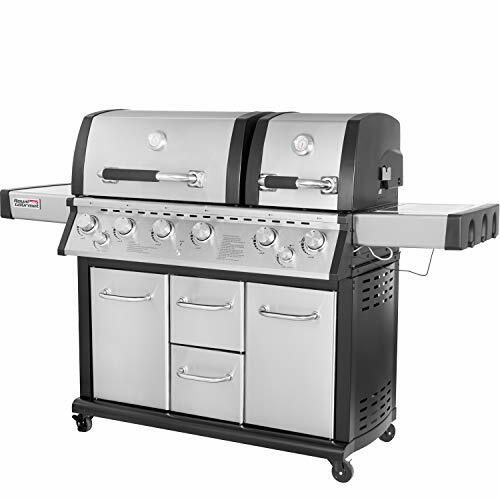 The GS4 Grilling system found on this grill uses tapered high-performance burners that create even heat distribution. Flavorizer bars catches drippings from the food and vaporizes them to add flavor while preventing flare-ups. Other features of this grill include stainless steel cooking grates, side tables with tool hooks, and a tuck-away warming rack. This grill, like all Weber charcoal grills, heats evenly and can reach 500 degrees Fahrenheit within minutes. However, the grill is a bit difficult to assemble. The wheels seem to get stuck a lot. In addition, the max heat output of the grill is low compared to other models. The Summit S-670 Gas Grill is a top-of-the-line gas grill offered by Weber. The summit features 430 grade stainless steel doors, hood, shelves, and control panel. The cart, on the other hand, is painted metal with cast aluminum end caps. As a top quality grill, it performs quite beautifully – beyond what the Genesis can produce. The 6 burners each have a max output of 10,000 BTUs while the sear burner is 10,600 BTUs and the side burner is 12,000 BTU. The grill has 624 square inches of primary cooking space while the warming rack, which is removable by the way, has 145 square inches. A built-in AC-powered rotisserie increases the grill’s versatility and the rear-mounted infrared burner responsible for cooking meat on the rotisserie has 10,600 BTU. Those are not the only features of this grill. There’s also a smoker box with a dedicated burner that has a max output of 6,800 BTU. Have we mentioned that the cook boxes of the Summit grill are waterproof and that it features water-friendly air vets? There’s no question that this grill is very, very expensive. But it really is worth the money if you have it. However, there are some minor complaints. Some of the components of the grill such as the LED lights may not always work. And the doors of the cart appear flimsy. We all know that an outdoor chef is only as good as his equipment and there’s no equipment more important than the grill. It can literally make or break your backyard barbecue. Possibly your reputation in the neighborhood. Of course, since no grill is the same, finding the right one can become overwhelming. It’s easy to get burned buying the wrong grill because there are so many things you’ll need to consider. Plus, there’s a lot at stake (pardon the pun). As we’ve said, your reputation is on the line. Dinner is too. So, how do you find the right stainless steel grill if not all stainless steel is created equal? Well, this buying guide should arm you with all the information you need to make the best purchase possible. There’s no shortage of love for all things stainless steel, particularly when it comes to grills. And there are several reasons why. For one, grills constructed of stainless steel no matter what grade it is look good. Shiny and polished, it can look amazing on anyone’s patio. Two, stainless steel (at least the right kind) can withstand high temperature. Three, stainless steel has a non-porous surface which means it is germ and bacteria resistant – a perfect choice since the grill will be handling your food. Four, good quality stainless steel is durable and able to withstand various weather conditions. And fifth, it is great at retaining heat. Of course, it doesn’t mean that there aren’t any disadvantages to getting a stainless steel grill. The major drawback is that it requires a whole lot of maintenance. Any dirt, dust, grease, and rainspots can easily reduce that beautiful shine. Maintaining its good looks will mean cleaning your grill after each use and not everyone has the time or energy for that. Also, stainless steel grills, particularly the ones made from 304 stainless, can be incredibly expensive. Before we get into the nitty-gritty of choosing a grill for your next backyard barbecue, we need to learn what makes a good stainless steel grill. Below are the factors that you should consider before checking the grill’s features. As we’ve already mentioned, there are different types of stainless steel. The 304 stainless is the most common type of austenitic steel. This type of stainless steel is high quality which also means a high cost. 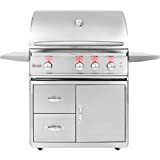 The Lion 32 Inch Stainless Steel Propane Gas Grill On Cart is constructed out of high quality 304 stainless steel. You’ll find other stainless steel grills made of 430 steel which is the most common type of ferritic steel. Unlike the former, this one is not as expensive. However, it is harder to form and weld in comparison to the 304 stainless steel. It is also less durable and less resistant to rust. Now, that doesn’t mean that any grill made of 430 stainless steel is to be avoided. It all depends on the thickness. The thickness of the metal increases the grill’s durability and resistance to discoloration. The measurement of the thickness of steel is expressed as “gauge.” The thicker the steel, the lower the gauge. For example, 10 gauge has a thickness of 0.1345 inches while 18 gauge has a thickness of 0.0478 inches.Look for grills that have heavy gauge construction and not just the lid such as the Lion Premium Grills 90823 40″ Natural Gas Grillwhich is constructed of 304 16-gauge commercial grade stainless steel. Don’t be shy to check the overall hardness of every part of the grill such as the body. Press it and check to see if it budges. If not, then the stainless steel used is most likely to be very thick. Rust can form due to any imperfections on the surface of the steel because it allows moisture and chemicals to sit in it. To make sure that your stainless steel grill isn’t vulnerable to such an event, make sure that its finish is smooth or even and clean. Any unevenness on the surface indicates a poor quality material. While determining the quality of the material used in constructing your stainless steel grill is important, the features of the grill itself also requires much thought. We’ve listed a couple of questions that you need to answer so you can find the perfect grill to feed your backyard barbecue cravings. One of the most important things you need to consider when purchasing a grill is cooking space. No matter how well your grill performs, it won’t make any of your guests happy if you need to cook their meals one at a time. On the other hand, you’ll be wasting your money if you buy a grill that’s too big for your family. Another reason why size matters is if you plan on cooking using the indirect heat method which requires a lot of space in order to create dual cooking zones. Plus, you’ll need to consider how much real estate you actually have available for your grill. You can’t go all out with a big grill if you don’t have room for it on your patio or deck. The Broil King Regal S590 Pro is perfect for feeding a large group with its 625 square inches of cooking space. The performance and durability of your grill is affected by the type of material used to construct your grate. Cast iron is best at reaching high heat and heat transfer. But it needs a lot of maintenance and is vulnerable to rust. Stainless steel is better at heat retention and more rust resistant. However, it doesn’t reach the high heat of cast iron. Also, it will get discolored (blacken) after a couple of uses. Porcelain-coated cast iron grates like what is used in the Royal Gourmet Mirage MG6001-R Two Split Lid 6-Burner Gas Grill have the benefits of cast iron but are prone to chipping, exposing the metal to rust. There’s no question that cooking on a grill is going to be messy. The grates will require cleaning after use. If you go with charcoal, you’ll need to dump the ash out. If you deal with gas, you’ll need to make sure that the burners are free from any drippings. In short, there’s work to be done after you got your food in your belly. And not everyone will have the energy to do that which means finding a grill that won’t take up too much of your time and energy to clean. This is especially true with a charcoal grill; you’ll want to make sure that the ash pan can be easily removed and the ashes dumped out. With a gas grill, you’ll want a removable drip tray that is effective in catching any grease. 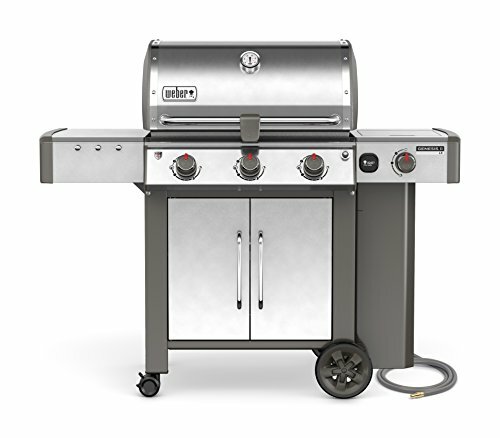 The Weber Summit S-670 Gas Grills, for example, has an excellent grease management system that makes cleanup a breeze. Stainless steel grills come in a range of prices. For example, the Monument Grills Stainless Steel 4 Burner is one of the more affordable options in this category. The Napoleon Grills Prestige 500 with Infrared Rear Burner, on the other hand, costs over a thousand. A lot of these grills have the same basic features. It’s the add-ons, brand, and the quality of the material that dictate the price. Any outdoor chef would probably be happy cooking on any of the stainless steel grills on our list. If you’re unsure on which one to get, here’s a piece of advice that bbq experts often give – while a grill is an investment, don’t buy more than you can chew. In short, keep it within your budget.